The Gift of Workers' Voices. In the state of Georgia and the "right to work" South it is rare to hear the voice of workers in the media, at public events and through the internet. The roots of this silence run deep, and, like most things are not kept in place by chance. In order to lift the power of Georgia workers... the voices, interests, dreams and priorities of GA workers must be amplified from the church pulpit to the Atlanta Journal Constitution to the workplace floor to the neighborhood association meeting and through our very own social networks and self made media. Workers must be front and center owning their own narrative. 1*) A recent piece of media coverage on CBS Atlanta that did in fact highlight the hard working school workers of Georgia.... The event covered is part of the Atlanta Jobs with Justice "Justice for School Workers" campaign that seeks to 1) reinstate earned unemployment benefits for all Georgia school workers (with back pay) and 2) develop union organizing drives in impacted workplaces and 3) develop student organizations to fight alongside campus workers. 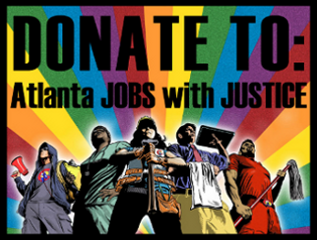 Click HERE for coverage that highlights two workers that have led the statewide Justice for School Workers campaign in GA. A 20 year Sodexo food service worker at Georgia Tech and a First Student Teamster bus driver in Savannah, GA.
2*) Atlanta Jobs with Justice has established a Workers' Rights Board comprised of faith, community, labor and academic leaders who use their position in the community to leverage the voices and agency of workers against injustice in the workplace and in support of the right to organize. These leaders listen to the stories of workers, issue recommendations, lead letter delegations and organize their base(s) to broaden and deepen support for GA workers. This August, we held a kick off event for the Atlanta Jobs with Justice Workers' Rights Board called the "People's Court" GA school workers were put front and center, articulating their hardships as well as the path forward for the Justice for School Workers campaign and efforts to hold rogue Labor Commissioner Mark Butler to some level of decency. Of all the gifts that one can give to a loved one... We would like to share the gift of GA workers articulating their need(s) and vision. In the coming year, let it be a task for all of us to prioritize the voice(s) of those who make our economy tick... The voice of GA workers. US Department of Labor at Sam Nunn Atlanta Federal Building. This is part of the Justice for School Workers Campaign. The Georgia Labor Commissioner Mark Butler unlawfully cut off unemployment benefits to laid off school workers this summer. The US Department of Labor (DoL) called him out for violating state and federal guidelines and threatened to cut off $72 million in federal administrative grants to the GA DoL if he did not immediately reinstate the benefits. Butler has since replied to the US DoL with the help of GA attorney general Sam Olens claiming that he is following state and federal guidelines and asking the US DoL to reconsider their stance. Please join us this Friday, we will be gathering at the regional US DoL office in Atlanta to thank them for their initial stand against Butler's attack on Georgia's school workers (bus drivers, food service workers, janitors, crossing guards). However, it is imperative for the well being of tens of thousands of school workers and their families that this issue is resolved expediently. We need the US DoL to press Mark Butler to follow basic state and federal guidelines. If you can make a sign please do! Otherwise we will have some signs for folks. "US DoL, Right the First Time"
Directions By MARTA: go to Five Points station and exit on the Forsyth street side. The Sam Nunn Federal center is about 200 yards to the left after exiting the station. Fannie Mae Blinked, But Mark We Still Got Your Back! When word of the planned candlelight vigil in support of Desert Storm veteran Mark Harris, outside of Fannie Mae’s South Eastern Regional Office VP’s home went public last week, one of Fannie Mae’s senior VP’s made contact with Mark. They made an offer that is closer to keeping Mark Harris in his home for good. This in its self is a huge deal! Fannie Mae is not a bank, and they rarely engage in direct negotiations with home owners. Because negotiations are underway we are calling off the planned demonstration today at Mark’s request. The fight for Marks home is certainly not over until a deal is made that can keep him in his home where he belongs. We are all on pins and needles waiting to see what will happen this week. While we wait for Fannie Mae to come to the table with a deal that Mark can live with, we need to make sure that we're keeping the pressure up. Our goal is to get 5,000 signatures on Mark's petition by the end of the week. To do that, we need your help! Can you send this petition to at least 5 of your friends asking them to support Mark Harris in the fight for his home? Can you help us meet this goal? We'll be sure to send updates on Mark Harris as soon as they come in, and will be ready to take action to keep Mark, and the many others that are facing a housing struggle in their homes this holiday season. You can check out some of the stories of the other brave residents who have chosen to fight the banks for their homes at our website here. I have worked hard and tried to do the right thing my whole life. I joined the Army in 1982 just out of High School, and served a year in Kuwait during Operation Desert Storm. After transitioning from active duty I got a job with UPS and was proud to join Teamsters Local 728. I purchased my home in 1996 with a VA backed home loan and refinanced it in 2004. In 2005 I started my own trucking business, and then the economy crashed. I got illnesses related to my time in Desert Storm, and I fell behind on my mortgage. I’ve been trying to catch up ever since; recently I’ve applied for the HomeSafe program here in Georgia. While my application was being processed my VA benefits kicked in, which meant I could afford to make my payments. Sadly, as my finances were finally coming together in October 2012, Green Tree Mortgage Servicing foreclosed on my home on behalf of Fannie Mae, despite the fact that I was doing everything I could to catch up and modify my loan. Fannie Mae auctioned off my home, knowing that HomeSafe was working with me. Now that I am receiving my service connected disability compensation I can make my monthly payments but Fannie Mae wants me out now. All they're willing to offer me is $1500 cash for keys to get out. In looking over my assignment documents I’ve also discovered that some of the country’s most famous robo signers signed the mortgage assignment that was used to foreclose on me.